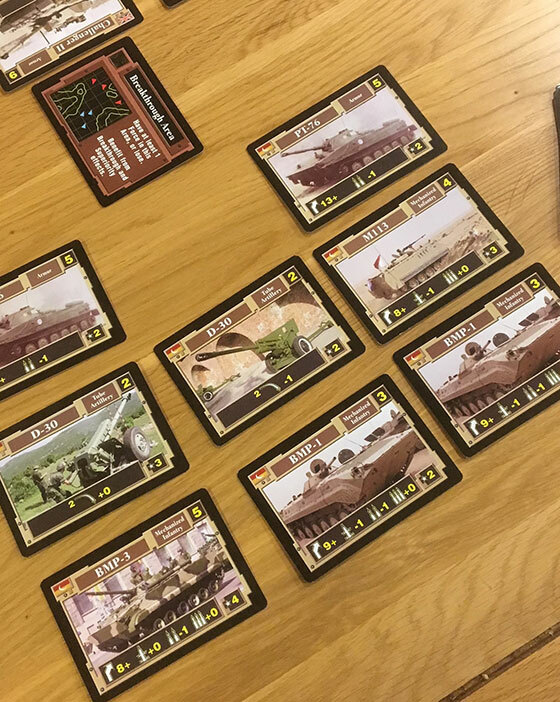 In Modern Land Battles: Target Acquired from Dan Verssen Games, two players (or more in the team based multiplayer variant) take control of opposing international forces to wage a fierce ground battle entirely in card form. The straightforward setup and lack of a board may suggest a lack of strategic depth, but anyone expecting to be a shallow experience could not be further from the truth. Modern Land Battles features seven different forces that are each represented by their own deck. The forces represented aren’t much of a surprise, but I was personally very pleased to see such a broad range of different nationalities and groups represented in the base game. The game includes forces from the USA, USSR, UK, China and Israel, plus both Arab Multinational and Insurgent groups. 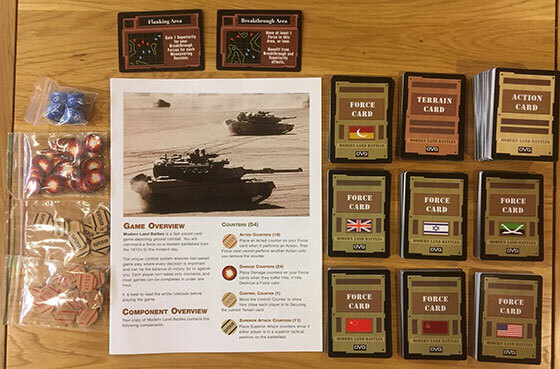 All are positioned relatively factually, with each vehicle represented on one or more cards and featuring its manoeuvrability, its armour value, its weapon type and strength and its value in command (or victory) points. Each vehicle is pictured and named and as you might expect, more powerful vehicles are generally higher value. 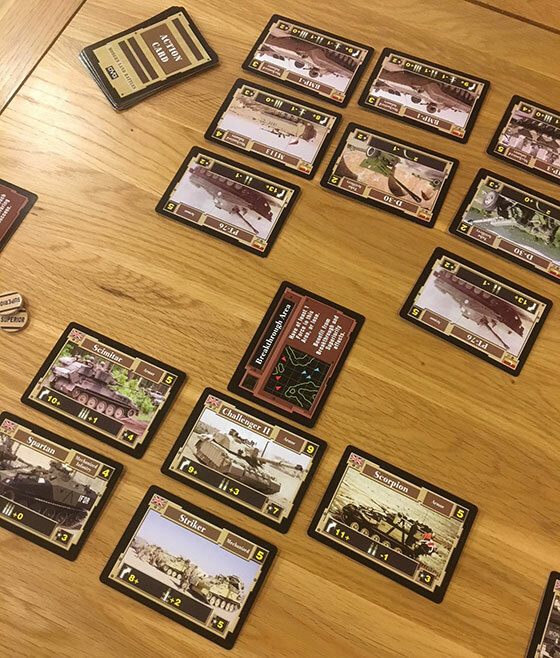 The relevance of vehicle value relates to the initial deck building phase of the game, the reinforcement of forces during game and ultimately, to determine who wins. 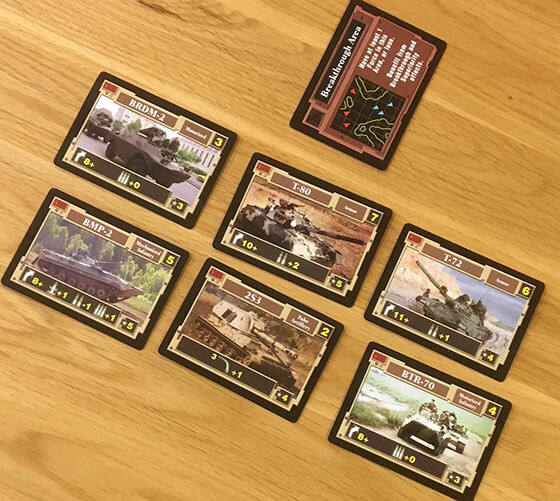 The game ends when a player accumulates twenty five victory points, either as the result of defeating enemy units, or by gaining them through securing terrain cards. In order to fight the good fight, players first build a force with a combined value of twenty five victory points. For the nations with heavy armour and modern technology, armies can consist of a small number of powerful vehicles or a greater number of weaker ones, whilst the militia style arrangement of the less advanced nations tends to lend itself to large armies of low cost units. Whatever your chosen make up of troops, all starting forces are placed on the battlefield in a central location call the “Breakthrough” area. 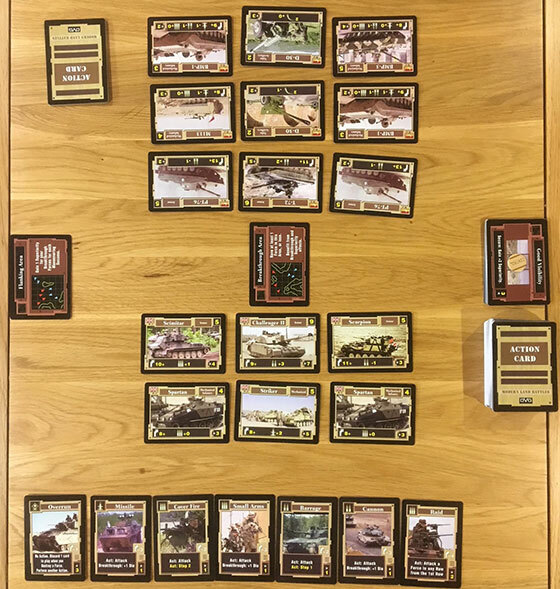 To one side, a “Flanking” area is placed and on the other, a “Terrain” card is laid down. 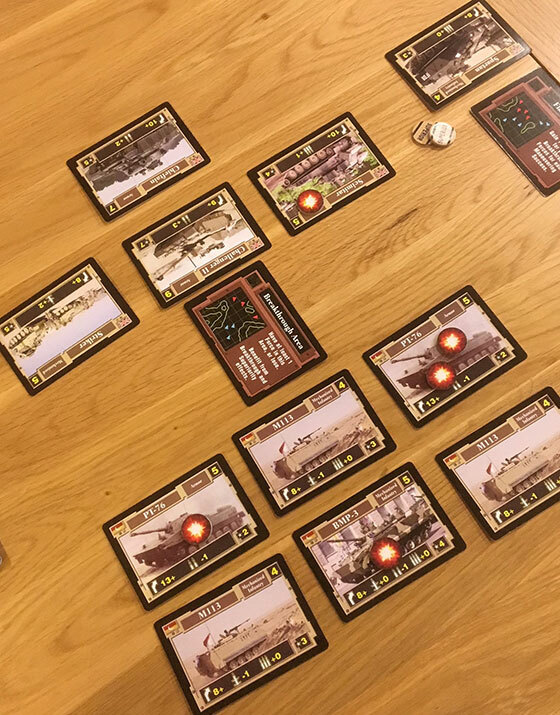 The players then take turns to take actions such as manoeuvring, attacking, reinforcing or resting, most of which are driven by a separate deck of action cards. The action card deck is an interesting addition, because of the range of cards on offer and how they affect the game. Some, like Raid, allow the traditional rules of the game to be bent or broken for a single turn, whilst others offer the opportunity to initiate combat between units whilst offering a bonus to the attack potential. 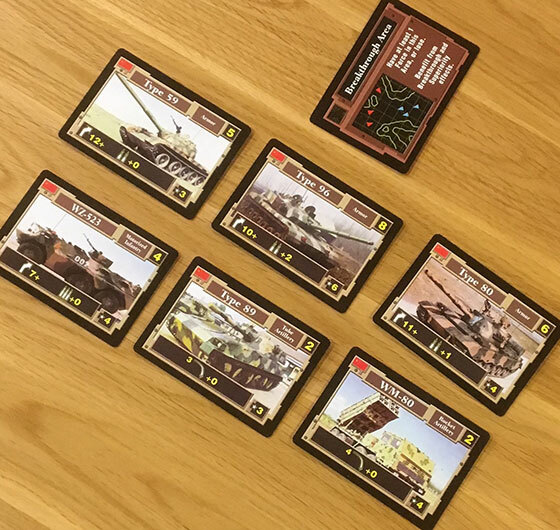 Others allow units to defend themselves or repel attackers moving towards either the Flank or Terrain cards to either side. On that note, let’s talk about manoeuvring. In Modern Land Battles, a large proportion of the combat between main battle tanks and supporting artillery will take place in the Breakthrough area. 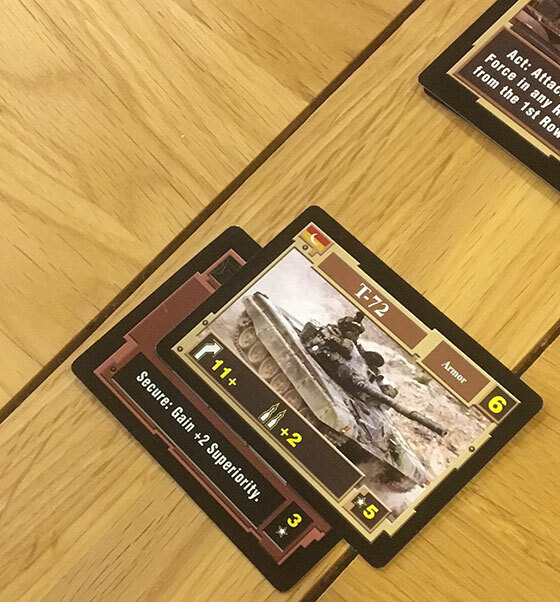 The Breakthrough card sits in the centre of the table and represents the main battlefield. 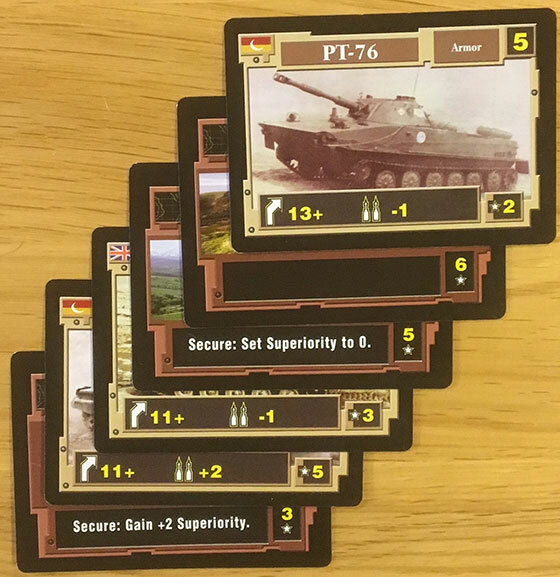 To move out of the Breakthrough zone, a unit must pass a manoeuvre check, which can be modified (positively) by any card in the action deck. 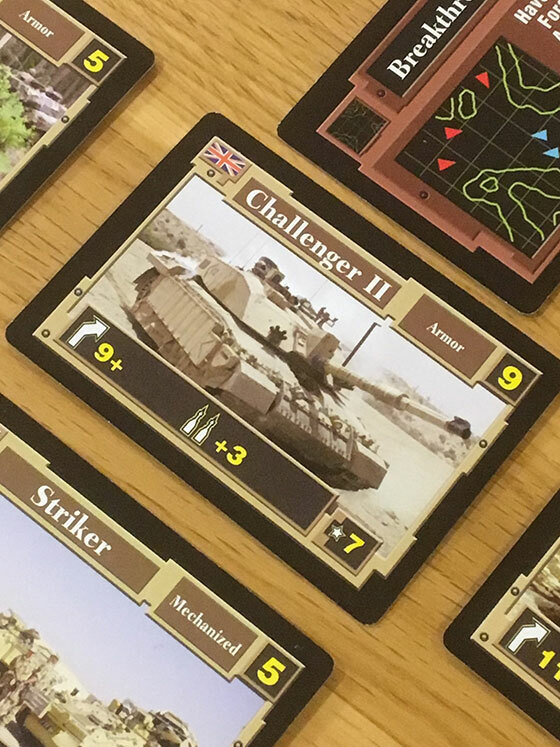 The reason for doing so is usually to either take control of the current Terrain (which involves moving a Control token through several spaces on the card) or to gain a Superiority token by succeeding at a flank manoeuvre. The weaker, more mobile forces in the game tend to focus more on gaining victory points from Terrain snatching, whilst a slower, more powerful force will participate in more direct combat in the Breakthrough zone. Modern Land Battles offers a different kind of experience depending on how deep you and your opponent want to go. 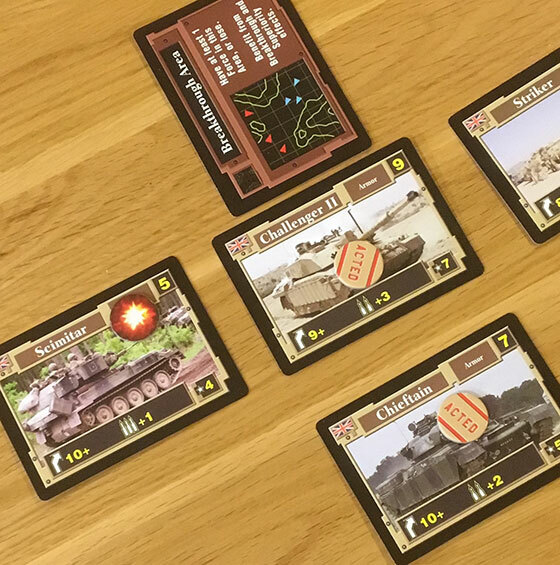 At the low end, the game is fantastic knockabout fun – a bit like toy soldiers in card form. It can be taught relatively quickly (there are only a few complex rules, although it isn’t a common game system and therefore has to be demonstrated) and it flows quite quickly from turn to turn. New or newish players will find a lot of satisfaction from the light deck building elements and then from identifying the strengths and weaknesses of their chosen force. Watching people learn about how best to score is fantastic from the perspective of the teacher, because the choice to either fight or outflank is really quite key, as is determining how best to spend your turn. This is probably where the game begins to show a bit more strategic depth, because a good player will want to make every turn as victory point efficient as possible by both picking fights and choosing when to flank. Firing artillery does not require a card, which can make it a powerful means to maximise offensive output without any card risk or return fire. Ultimately when I played the game against my most experienced friends, we found that flanking was a more powerful tactic overall, but that fighting in the Breakthrough zone was more fun. If you read up on BGG or similar, you might find people suggesting that Modern Land Battles is unbalanced as a result. I don’t honestly think that there is a real issue here for any average gamer because any single failure to maximise the efficiency of a turn would probably counteract any perceived advantage. 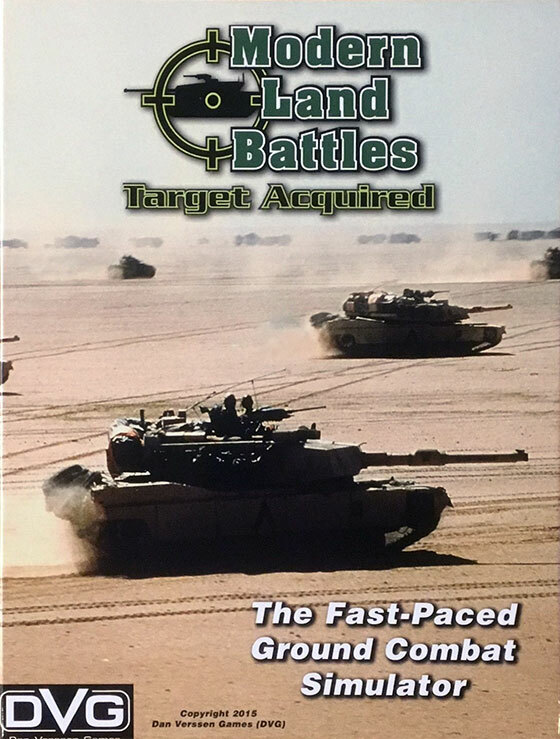 For me Modern Land Battles was a really surprising and highly original addition to the collection of wargames that I am working my way through as part of the series that Nerdly is exploring. I understand that Modern Land Battles is an evolution of another Dan Verssen Games title called Modern Naval Battles, but I haven’t personally experienced that and in any case, ground combat is more personally interesting to me. 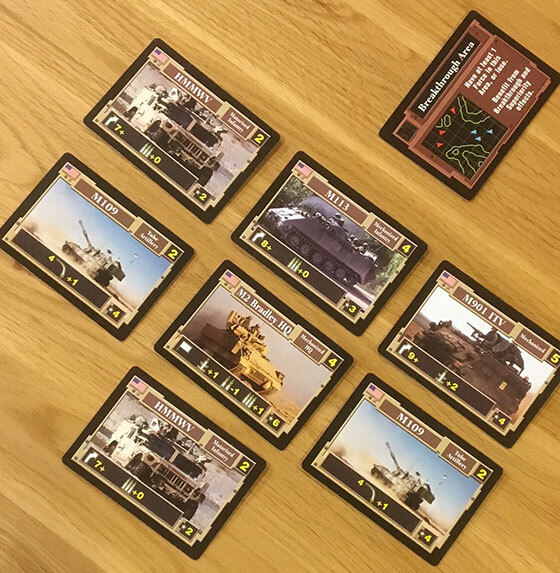 Modern Land Battles delivers a boxed experience that is relatively compact (you could take just a couple of force decks, dice and the other ancillary cards in your work bag, for example) and very original. It’s also hugely fun to play with almost anyone and as long as you are prepared to “DM” the game a little bit with new players to help them succeed, you’ll have a fantastic time. Highly recommended.